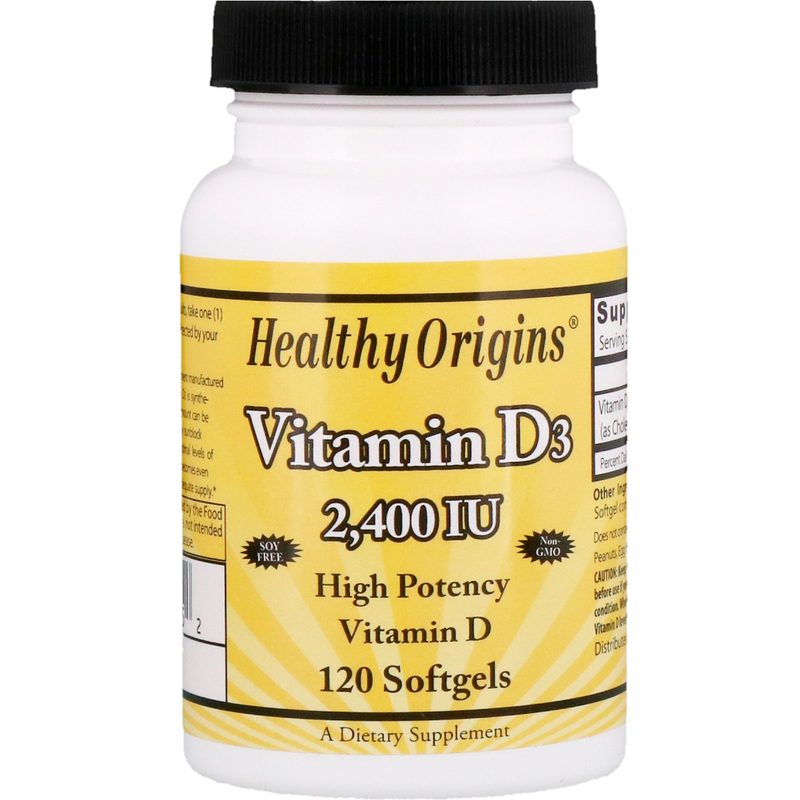 Healthy Origins Vitamin D3, 2,400 IU is a key nutrient manufactured in a highly absorbable liquid softgel form. Vitamin D3 is synthesized in the body from sunlight and only a small amount can be obtained from food. The winter season and many sunblock products inhibit the body's ability to produce optimal levels of Vitamin D. As a result, Vitamin D3 supplementation become even more necessary to ensure your body receives an adequate supply. As a dietary supplement, take one (1) softgel daily, preferably with a meal, or as directed by your health care professional. Pure cold-pressed olive oil. Softgel consists of gelatin, glycerin and water. Does not contain sugar, yeast, wheat, gluten, soy, barley, fish, shellfish, peanuts, egg, or milk. No preservatives, artificial colors or artificial flavors. Caution: Keep out of reach of children. Consult your health care professional before use if you are pregnant, nursing, taking medication or have a medical condition. 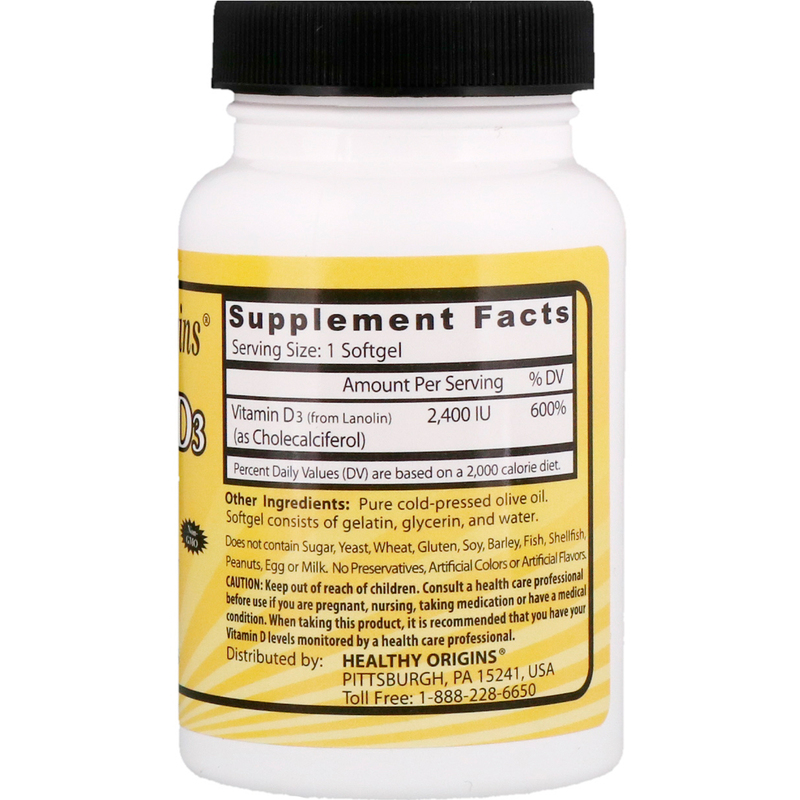 When taking this product, it is recommended that you have your Vitamin D levels monitored by a health care professional.